A few days ago I hooked up with the fine folks at AVerMedia to learn a little more about their new USB HD DVR device set to compete with the Hauppauge HD-PVR. This device, like the Hauppauge HD-PVR captures HD content (up to 1080i) via Component Video In and therefore uses the “Analog Hole” to record and tune the content you want from Cable and Satellite. My interview with AVerMedia was with Stephen Dix, VP of Sales & Marketing and Dominic Wong from engineering. I’m really glad I had the chance to talk one-on-one with these guys as it gave me good insight into where AVerMedia is in the HTPC market and where they plan to be going forward. I’ll get into the companies history and future plans with the North American HTPC market in a future post but the basic takeaway from my conversation is that AVerMedia is very serious about HTPC and working towards increasing their presence in the U.S. market. Note two things in those specs above: First, there is no Optical audio in or Optical audio out. This is a biggie for some as it means no 5.1 audio. But if priced right this might not be a huge deal really. I confirmed with AVerMedia that this first generation of the device will only have stereo audio. Secondly you’ll note the HDMI output. At first this seems a strange addition as it doesn’t record from HDMI. But it will allow you to connect the device to a TV with HDMI inputs. I confirmed that the device will not ship with a remote control. No word on support for Windows MediaCenter and based on how the Hauppauge HD-PVR device has been shunned by Microsoft, I’d expect the same situation here. I’m also guessing that 3rd part support could be added for Windows MediaCenter if DVBLink gets it working as they have with the Hauppauge HD-PVR. Despite reports to the contrary, the AVerMedia AverTV USB HD DVR does hardware encoding just like the Hauppauge HD-PVR does. Matter of fact the AVerMedia will pack in a very similar chip for hardware encoding to h.264. AVerMedia tells me the semiconductor in their chip is a little more advanced too – we’ll have to check that in some real-time testing. The estimated time of arrival for the AVerMedia AverTV USB HD DVR April 2010 which is a month later than originally announced. The plan to launch with a MSR of $199 which is pretty close to what the Hauppauge HD-PVR is selling for. I expect this should keep some pressure on Hauppauge to keep their price down and could mean the AVerMedia will sell for discounts at lower prices down the road – great news for HTPC owners! The use of more than one of these devices at one time on a single HTPC hasn’t been tested thus far but in theory should work. There is no fan inside for cooling. Overheating is an issue Hauppauge had with their HD-PVR initially so we’ll watch this closely with the AVerMedia. I’m excited about seeing competition for Hauppauge in this space – options are always a good thing. Hopefully AVerMedia will put out a gen 2 device that supports 5.1 audio as well. 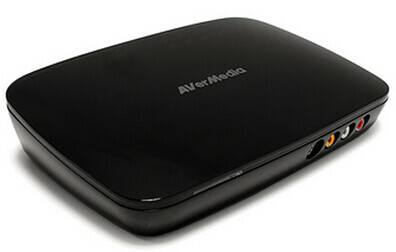 As soon as they are available I’ll have a full review of the AVerMedia AverTV USB HD DVR here at GeekTonic so stay tuned!